Note: an updated version of this article can be found here. Over the past few months I have written extensively about the the current whooping cough (Bordetella pertussis) outbreak which has reached epidemic levels in areas like the Washington state, and has been considered one of the worst outbreaks in the USA during the past several decades. The outbreak has lead to several deaths here in the USA and in other countries such as the UK. Of course, this outbreak has lead to the blame game from the antivaccination crowd, because they claim that since A) most kids are vaccinated, and B) we’re having this outbreak then C) either the vaccines are useless or are actually the cause of the outbreak. Seriously. They blame the vaccines. So I decided to search the internet (or just read the comments section of my blog) to find the most popular vaccine denialist arguments regarding pertussis vaccinations, and deconstruct and debunk them. Hopefully, it will be a useful tool for you when you’re engaging a ridiculous argument with one of those antivaccinationists. Of course, I could use the information too. That “only 8% of those stricken were unvaccinated” has been repeated over and over again by the vaccine denialists as proof that being vaccinated is more dangerous than not being vaccinated. Now Mercola is referencing this study published in Clinical Infectious Diseases published in March, 2012. Or should I say “misreferencing.” Because, as Orac said in Joe Mercola attacks vaccinations again. Film at 11., “Needless to say (but I’m going to say it anyway), Mercola is being disingenuous here. For one thing, the authors stated quite clearly: ‘In reviewing cases confirmed at our medical center during this outbreak, we noted effective protection of younger children. 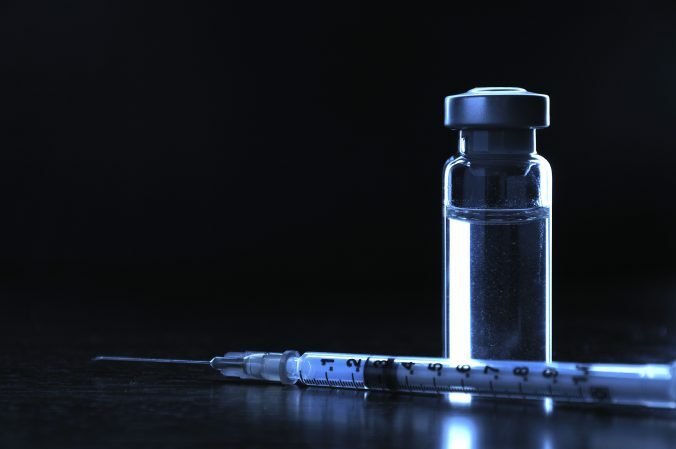 '” Once again, I guess if the vaccine denialists lack evidence, then invent it if necessary. Let’s translate into clear English. This study doesn’t say anything like what Mercola said. The vaccine still works, but the immunity from it wanes sooner than expected, and that this area of California doesn’t have a high enough rate of vaccination to prevent epidemics. Moreover, the CDC and FDA should change the vaccination schedule to provide earlier boosters to protect older children and teenagers (and I would contend adults). This is how science works, get the evidence, revise the hypothesis, and retest the hypothesis. Just in case you think I’m inventing this stuff, another study in the Journal of Pediatrics, published in May 2012, makes essentially the same conclusion: it found an increase in pertussis among children aged 7-10 years who had completed the DTaP immunization but who had not yet received the Tdap booster recommended at age 11-12 years, along with a concomitant decrease in cases among adolescents from ages 11 to 14. The study concluded that preadolescents are subject to waning immunity with the current schedule but that the adolescent Tdap dose is effective in protecting younger adolescents. But these two studies lead to the Nirvana Fallacy amongst the antivaccinationists–if the pertussis vaccine isn’t perfect, then it’s useless. We’ve already shown that the two studies have provided evidence that we need to adjust the vaccination schedule protect one group of later adolescents but is still effective in other groups of children. And even those with waning effectives were still protected. In other words, when you directly compare the likelihood of catching pertussis, it’s still much safer to be fully vaccinated than not. By the way, this is how science works again. Make valid statistical comparisons, not ones that are fallacious. The vaccine isn’t perfect. In medicine, perfection is a fallacy pushed by the alt med world. Real science is nuanced and honest. 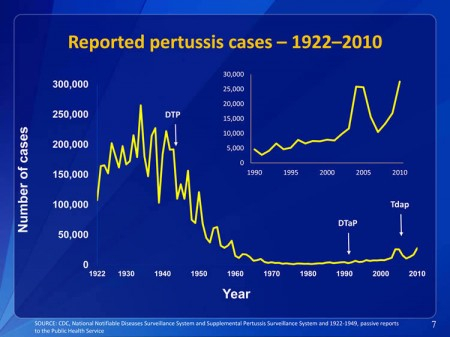 This graph represents the absolute number of pertussis cases in the USA, which shows a dramatic drop since the introduction of the pertussis vaccine in the mid-40’s. If this graph was converted into per capita, accounting for the nearly 2.5X increase of US population from the 1930’s, the drop would be even more dramatic. In other words, even with the what the antivaccinationists claim as a “bad vaccine”, pertussis is just about wiped out compared to what it was just 70 or 80 years ago. But, as you can see, the slight increase recently means that we have to vigilant, and we have to do some adjustments to the vaccine. Medicine does that all the time. I’m pretty certain that cancer therapies have evolved from 1930 to 2012. And that’s a good thing. Vaccines save lives. That’s obvious.